Renowned British comics artist, Simon Bisley, created an all new poster for Neil Marshall's Centurion (reviews here and here) featuring the filmâ€™s main characters played by Michael Fassbender and Olga Kurylenko. This is the first time Bisley has created a piece of art for a motion picture. He is best known for his 1990s work on ABC Warriors, Lobo and SlÃ¡ine; his style, reliant on paints, acrylics, inks and multiple mediums, and takes inspiration from rock album covers and graffiti, as well as traditional comics art. Centurion, a gripping survival thriller set in early AD Britain, finds Quintus, the sole survivor of a savage raid on a Roman frontier fort, joining General Virilusâ€™ legendary Ninth Legion to march north and wipe out the terrifying tribes known as the Picts. When the Legion is attacked and Virilus seized, Quintus struggles to survive behind enemy lines with a small band of soldiers in a race to save their general and evade capture, torture and certain death. 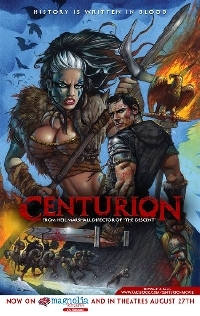 Magnolia Pictures will release Centurion on August 27, 2010; the film is also currently available VOD. Bigger poster after the break. Watch the trailer. I like Bisley's work on Slaine the best.